The Lucozade Sport™ ‘Fuel Your Performance’ Campaign got off to an energetic start recently at its first running clinic with Pacesetters Athletic Club, SMART Athletics Club and Tadonamo Triathletes. The exclusive event was the latest in a series of campaign activities designed to engage with Malaysian runners and an ongoing effort to bring its scientifically-proven formula to more than 1 million Malaysians through ground-level events and sponsorship of popular events such as the recent Reebok Spartan Race. Participants had the opportunity to learn from seasoned runner Edan Syah and exercise & sports nutritionist Dr Mahenderan Appukutty, Faculty of Sports Science and Recreation from Universiti Teknologi MARA who shared their experience on training and nutrition for sports enthusiasts. As April is also celebrated as Nutrition Month Malaysia with the tagline ‘Eat Smart, Get Fit & Feel Great’, the clinic was also a fitting opportunity to stress the importance of eating right for energy and performance. “High-performance athletes require a dietary plan that’s tailored to support and enhance their training. This includes consuming an appropriate amount of protein to help to build, maintain and repair muscle tissue. Hydration and energy are also essential factors for runners as stores of carbohydrates in the body get used up,” explained Dr Mahenderan as he provided structured guidelines designed to help participants fuel their runs with the right nutrition and hydration. To maintain consistent energy levels, approximately 30-60g of carbohydrates are needed every hour – this would be equivalent to 1-2 bottles of Lucozade Sport™ for each hour of racing. Its science-based formulation of electrolytes and carbohydrates is specifically designed provide enhanced hydration to fuel athletes during prolonged exercise. 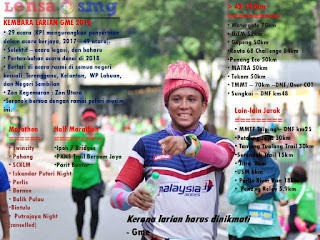 Edan Syah started running eight years ago. The self-coached runner qualified for the 119th Boston Marathon 2015 and finished with a time of 2:41:55, and became the fastest and the youngest Malaysian to have run the Boston Marathon! At the Tokyo Marathon 2016, he achieved a personal record of 2:38:55 and is now ranked as the fastest marathon runner in Malaysia for 2016. Edan aspires to be the youngest and fastest Malaysian to complete the 6 World Marathon Majors (WMM)  under 2hours 45minutes by 2018. Mohd Amran bin Abdul Ghani has worked as a fire fighter since 2001. In 2014, this dedicated athlete came in first in the IRONMAN 70.3 at Putrajaya and again at IRONMAN Langkawi with a time of 10:15; at both races he was crowned Best Malaysian. This comes on the heels of his accomplishments in Powerman Malaysia where he came in first in his age category for 5 consecutive years, from 2009-2013. Amran’s dream is to race in international triathlons all over the world. Mohamed Allie Helmy is a corporal in the Armed Forces who keeps fit because of passion, not only because of his line of work. He was the champion for the Port Dickson International Triathlon, Kedah International Duathlon 2015 and 113 Desaru Triathlon; and came in close as the second Malaysian in IRONMAN Langkawi 2015. Helmy aspires to race in the IRONMAN World Championships in Kona, Hawaii next year. Alex Au-Yong wanted to channel his passion for long-distance running into something tangible for communities in need, so he created the XtraMile Run, Malaysia’s first-of-its-kind 100km charity run. The first event in 2011 raised RM111,000 for StART Academy, and the subsequent run in 2013 raised RM165,000 for the Dignity for Children Foundation. For 2016, his goal is to raise RM500,000 to ignite community involvement, provide education on holistic nutrition to children. These Advocates embody what it means to reach for their dreams, and Lucozade Sport™ now invites other Malaysian runners to share their hopes and dreams as well via myLucozade@suntory.com. A trusted brand since 1927, Lucozade Sport™ continues to hydrate and engage with Malaysian athletes at high-profile sporting events. Find out more about the ‘Fuel Your Performance’ campaign at www.lucozadesport.com or www.youtube.com/lucozade. All photos credit to Lucozade. The Lucozade™ brand was developed in 1927 by the chemist William Owen. Lucozade Sport™ was developed in the 1980’s. First launched in 1987, Lucozade Sport™ Orange is the No, 1 sports drink in the United Kingdom. Formulated based on scientific evidence, Lucozade Sport™ Orange is endorsed by sportsmen and global sports associations and a trusted sponsor for sports events around the world. Additionally, The Lucozade Sport Science Academy helped to further develop the area of sports nutrition, share expertise and help improve performance. This has enabled us to provide a performance edge to all sports and exercise participants, no matter what their level. Suntory Beverage & Food Ltd (SBF) is a leading global soft drink company, headquartered in Japan and listed on the Tokyo Stock Exchange, with an integrated platform across five key regions: Japan, Europe, Oceania Southeast Asia and the Americas. SBF has an extensive line-up of products and in 2012 was the number four supplier of soft drinks globally and second in Japan. SBF’s vision is to be the leading global soft drink company recognized for its premium and unique brands. On 31st December 2013, SBF acquired Ribena® and Lucozade™ and Suntory’s new Malaysian subsidiary commenced its sales and marketing operations in January 2015. The World Marathon Majors is a series consisting of six of the largest and most renowned marathons in the world: Tokyo Marathon, Boston Marathon, Virgin Money London Marathon, BMW BERLIN-MARATHON, Bank of America Chicago Marathon and TCS New York City Marathon. IRONMAN 70.3 is an international triathlon race of a 1.9km swim, 90.1km cycle and 21.1km run. Powerman Malaysia is a duathlon race of 10km run, 60km cycle and 10km run.